For that, we need mirrors. Counter to the typical meaning of the phrase “smoke and mirrors”—that is, rather than concealing sleight of hand—I suggest that in the case of the Archaeology Division (AD), mirrors reveal the best aspirations of the AD. Our choices for who we elect to offices, who we recognize, and who we reward are a reflection of the hope and promise of anthropological archaeology. 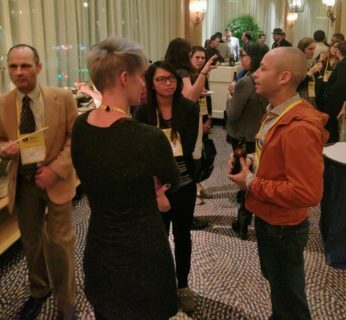 The chance to reflect and appreciate was made possible by the efforts of AAA staff, volunteers, and the AD Program Editor Jason De León, who took on the steep challenge of being Annual Meeting Program Chair. Dante Angelo’s article, “Histories of a Burnt House: An Archaeology of Negative Spaces and Dispossession,” was awarded the 2018 Gordon R. Willey Prize, which “recognizes the best archaeology paper published in the American Anthropologist over a period of three years.” Like Jason De Léon and several of the student award winners, Angelo focuses on archaeology of the contemporary past. His article presented a contextual historical analysis of a fire that partially destroyed a late nineteenth‐ or early twentieth‐century house in the city of Arica, Chile. His combination of historical, archaeological, and ethnographic methods was crucial for the house to tell the story of its life. This narrative foregrounded how the house and its materiality played a decisive role in mechanisms of dispossession and the displacement of its inhabitants, an example of wider ongoing dynamics of gentrification and heritage making. 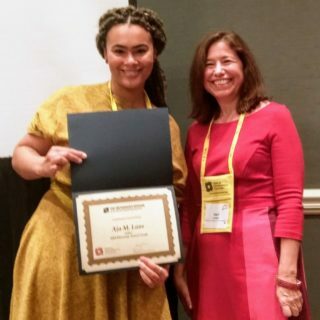 The two Student Membership Award winners and one Diversity Travel Award winner focus on contemporary archaeology, particularly regions of recent or ongoing violence. Annalisa Bolin, a PhD Candidate at Stanford University investigates rights to the past in post-genocide Rwanda. Kasey Diserens Morgan, a PhD Candidate at the University of Pennsylvania, examines the social dynamics of ownership rights in post-conflict Quintana Roo. Nicole Smith, an undergraduate at the University of Michigan, researches the tender and brutal: the materiality and memory of child migrants. Her work is an intimate and unrelenting view—through evidence such as articles of clothing, backpacks, baby powder, and pedialyte bottles—of the hostile environmental conditions that migrants are having to endure. Just as migrant children merit greater archaeological attention, so too do bodily experiences of women. Anne Sherfield, who graduated with her BA in 2018 from the University of Michigan, investigates archaeological evidence, particularly the architecture of the houses at Deir el-Medina, to understand better women’s experiences of menstruation in the past. A challenge that faces archaeology is to make its practitioners and practices more inclusive, respectful, and representative. After conducting numerous interviews of archaeology students and professionals, Laura Heath-Stout, a PhD Candidate at Boston University, developed several crucial points of intervention in teaching and research to promote greater diversity in archaeology. Aja Lans, a doctoral student at Syracuse University, focuses on how black feminist theory might aid anthropologists to recognize the various forms oppression takes as well as reconsider what makes us scientists. Our choices for who we elect to offices, who we recognize, and who we reward are a reflection of the hope and promise of anthropological archaeology. 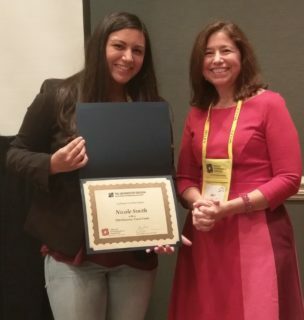 Close, respectful work with descendant communities by two student award winners calls attention to how meaningful archaeology can be important for today’s efforts for recognition. Liam Wadsworth (not pictured), an MA student at the University of Alberta, has conducted a geophysical survey of unmarked graves of participants in the Underground Railroad at the British American Institute Cemetery. Chandler Fitzsimons, a PhD Student at the College of William & Mary is focusing on the interrelationships of landscape, community and time in Abiquiú, New Mexico. A recurring theme across many of these projects is that of memory, forgetting, and place. Jade Robinson, an MA student at the University of Nebraska, Lincoln explicitly focuses on memory in her analysis of shell ornaments from Salmon Pueblo, New Mexico. It is an analysis of several kinds of legacies: artifact collections in museums, digital collections of legacy data, and the memory making of the ancient community. You can look forward to posts in the Section News by each of these winners in upcoming months. Patricia Crown, the Leslie Spier Distinguished Professor at the University of New Mexico, received the A.V. Kidder Award. She has conducted field investigations in the Ancestral Pueblo, Mogollon, and Hohokam areas of the American Southwest, and is known for her research on the production, consumption, exchange, and discard of artifacts in the past, particularly archaeological ceramics. She has conducted analyses of ceramic composition and residues in collaboration with scientists at Los Alamos National Laboratory, Sandia National Laboratory, the Smithsonian Conservation Analytical Laboratory, and the Hershey Company. Her ongoing study investigates how children learned to make ceramics in the past, distinct communities of practice, and the sequence of learning in many areas of the Southwest. 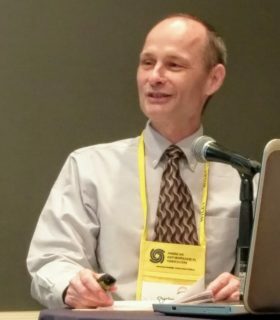 Crown served as Chair of the Archaeology Division of the AAA. 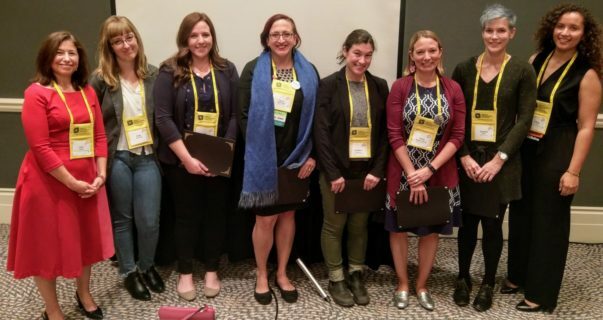 Seen together, the group of award winners includes the energy and hope of undergraduates, critical place staking of underrepresented scholars and professionals, and pioneers of excellence and innovation in archaeology. To paraphrase Frederick Douglass, the growth of our profession, archaeology, requires reflection, as well as observation, to appreciate it. It is reflection that shows the way to navigate future challenges and opportunities. With that, I leave to let the next doctor take my place. Kathryn Sampeck is an associate professor of anthropology at Illinois State University and was the 2016–2018 Secretary for the Archaeology Division.